Middens are places where the remains of food (such as shellfish and bones), ash and charcoal from fires, and other traces of settlement can be found. This midden at Waiotahe near Ōpōtiki is about 500 years old. Most of the shells are pipi from the local estuary. 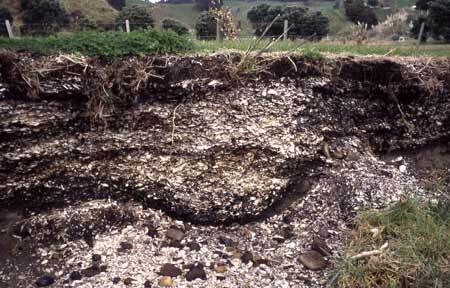 Such middens provide evidence that early Māori settlements were often coastal, and that food from the sea was an important part of the diet.